Bring the Ancient Falmer Tome to Urag gro-Shub. Find an Ancient Falmer Tome. Bring it to Urag gro-Shub. 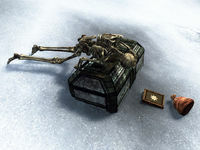 After finding an Ancient Falmer Tome, take it to Urag gro-Shub in The Arcanaeum at the College of Winterhold. He will purchase the book from you for 1000 gold, and give you a translated copy. Between the Wayshrine of Learning and the Wayshrine of Sight. If you are approaching the book from the Wayshrine of Sight, simply head southwest until you come across a path in the middle of a ridge. At the top there will be several Frostbite Spiders. Head down the other side. Among the ruins to the right there will be a skeleton clutching a chest. The book is next to the chest. If you are approaching from the Wayshrine of Learning, go to your right along the frozen lake and you will see the ruins. Most easily accessed with the Emerald Paragon, which is located on the body of a Frost Giant in the Falmer village. Once you have the Emerald Paragon, travel to the Paragon Platform (detailed directions to the platform are on its page) and place the Emerald Paragon in the Paragon Socket. A portal will open to the Forgotten Vale Overlook. Turn to your right (north) and make your way down the rocky river. The book is a short way down, just after the two broken pillars. It is next to the chest on the right-hand edge of the waterfall, by another broken pillar. You can also jump from the Inner Sanctum Balcony to the south and make your way along the cliffs. Make sure you have at least 450 health, or use Become Ethereal, to survive the jump. Near the Glacial Crevice. Travel upriver toward the entrance to the Glacial Crevice, but do not enter. Instead, turn around just before the fence, and you will see a path that leads up to the mountains and another path that goes over the river. Take the rock bridge pathway that crosses the river and continue to cross over the next rock bridge. You will reach a fork, one is a Falmer bridge and one is a rocky pathway up into the mountains. Take the Falmer bridge (made of chitin rather than rock). Upon crossing that bridge, turn right and take the rock bridge going down towards a lone Falmer tent. The book will be inside that tent on a table. This book is on the table in the last hut before entering the tunnel leading to the Shrine of Radiance (the last Shrine after exiting the Glacial Crevice). There's a fire brazier outside the entrance to the tunnel and the hut is elevated directly above it. Urag gro-Shub will give 1,000 gold per Ancient Falmer Tome (Unknown Book), for a total of 4,000 gold. He takes them all if all four tomes are in your inventory, and it will appear that he only gave you 1,000 gold; however, he indeed gives 4,000 gold. This can be verified by checking your total gold before and after giving him the Falmer Tomes. This quest will remain in your available quest list until all four tomes have been given to Urag gro-Shub. Urag will not enter a conversation during the quest "The Staff of Magnus", and the tomes cannot be sold until after the quest is completed. The following empty quest stages were omitted from the table: 0, 10, 30, 200. On the PC, it is possible to use the console to advance through the quest by entering setstage DLC1VQFVBooks stage, where stage is the number of the stage you wish to complete. It is not possible to un-complete (i.e. go back) quest stages, but it is possible to clear all stages of the quest using resetquest DLC1VQFVBooks.